« Homepage / Food and Healthy Eating / Recipes / "Grilled Pork Chop Farci"
Mix Creole cream cheese, chopped fresh herbs, crushed red pepper, and olive oil. Place a slit along the long side of the pork chop. Insert a generous spoonful of mixture into each pork chop. Rub each chop with salt and pepper and grill for 8 minutes on each side. Let rest. Cut the steamed pumpkin into strips. Brush with olive oil, salt, and pepper. Grill for a few minutes on each side, and brush cane syrup on pumpkin until it caramelizes. Watch closely to avoid charring. Add olive oil to a warm skillet. Toast garlic and then add the Tuscan kale. Add salt and pepper and cook until tender. 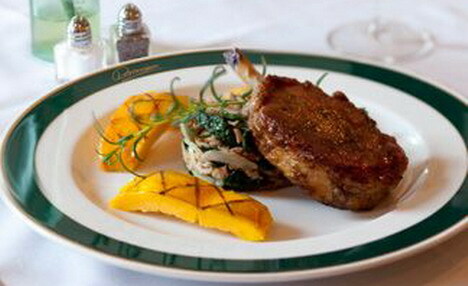 Serve pork chop on kale with a couple slices of grilled pumpkin. Savor the flavors of the holidays. Here you can write a comment to the post "Grilled Pork Chop Farci"